Ryan Gosling plays Sgt. Jerry Wooters in Gangster Squad. 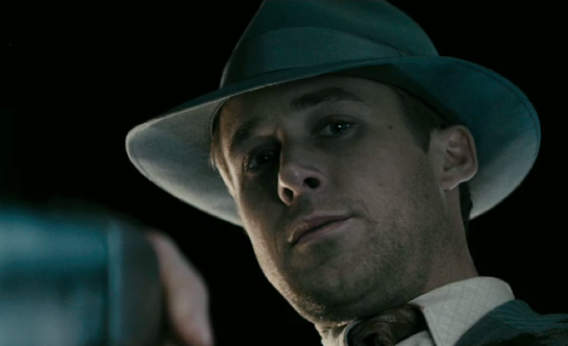 Still from the trailer for Gangster Squad. Jay-Z’s “Oh My God” begins blaring about a minute and a half into the trailer for Hollywood crime flick Gangster Squad. That the song was recorded more than a half century after the events of the film doesn’t stop it from matching the visuals perfectly: Gangster Squad, which is set in Los Angeles, is clearly more interested in the style of Hollywood today than Hollywood in 1949. Jay-Z may be a proud East Coast American Gangster, but that’s no problem, either: Gangster Squad is aiming broad. And once you accept that, despite its all-star cast—Sean Penn, Ryan Gosling, Josh Brolin, Emma Stone, Nick Nolte, and more—Gangster Squad probably won’t be winning any Oscars (and probably isn’t even aiming to), it’s easy to see that it will probably be a lot of fun. Wisely, the trailer opens with what might be the film’s biggest attraction: The overacting glory of hall-of-fame overactor Sean Penn, who plays real-life Jewish mafia boss Mickey Cohen. “I’m not an educated man,” Penn slurs, before mythologizing about how “Every kingdom comes up bloody, every castle is built on a pile of bones.” Cohen may be speaking only of his own mafia crime ring, but it’s clear that the trailer wants us to hear it as a Hollywood origin story. In case this isn’t obvious enough, the trailer closes with a team of Tommy Gun-toting gangsters unleashing a storm of bullets out through the silver screen. Tinseltown crime flicks and Hollywood creation myths are nothing new—this trailer conjures up everything from L.A. Confidential to blockbuster video game L.A. Noire—but Gangster Squad most closely resembles a Chicago gangster flick: The Untouchables. Here Josh Brolin plays the L.A. Eliot Ness who—on the orders of rock-tumbler-voiced Nick Nolte—will stop at nothing to bring down the crime ring with his small, off-the-books crew. Ryan Gosling seems as peculiar (that casual high-pitched voice!) and magnetic (did you see how he caught that shotgun?) as ever, while Emma Stone looks predictably alluring in the classic red dress of the femme fatale. The only thing missing is a baseball bat.